Apple’s recently released ARKit framework allows millions of iPhone and iPad owners to experience augmented reality (AR). Facebook is working hard to bring virtual reality (VR) to wider audiences. Microsoft is using mixed reality (MR) to combine virtual objects with the real world. 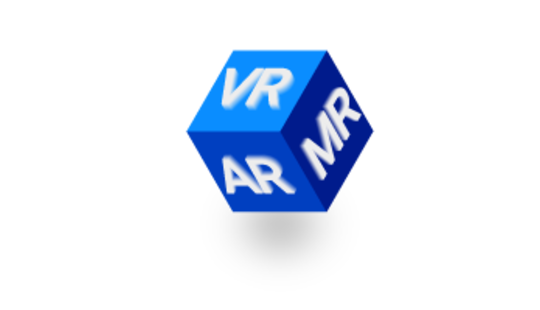 But do you have a clear understanding of the differences between VR, AR, and MR? We’ve written this guide to explain what reality technologies are and how businesses can benefit from them. There are lots of definitions of the term Virtual Reality, and some are quite long and complicated. Let’s be brief and clear: virtual reality is an artificial digital environment that completely replaces the real world. With VR, users experience artificial sounds and sights and feel as if they’re in a digital world. Imagine opening your eyes and seeing a computer-generated world all around you; you can move in this environment and even interact with it. That’s what virtual reality is like. As their name suggests, these VR headsets are connected to a computer (or a gaming console) that generates high-quality virtual experiences. The processing power of modern computers is huge, so they can generate realistic and persuasive digital worlds. VR headsets can be used along with special controllers. In this case, users can actually interact with the virtual environment they’re immersed in. As might be expected, PC-connected headsets provide the most engaging VR experiences. The most popular PC-connected VR headsets are HTC Vive, PlayStation VR, and Oculus Rift. As you’ve probably guessed, PC-connected VR headsets are quite expensive and relatively few people are willing to drop that kind of cash on them. Yet there’s another way to experience virtual reality – using standalone headsets that don’t need to be connected to a computer or console. Most standalone VR headsets use a smartphone screen to provide the virtual reality experience. Such devices are quite affordable, as users can simply insert their smartphone into the headset to enjoy VR. Samsung Gear VR, Google Daydream, and Google Cardboard work exactly this way. Other standalone headsets work on their own. Facebook’s soon-to-be-released Oculus Go, for example, will need neither a computer nor a smartphone to generate virtual experiences. This device is likely to make virtual reality technology a lot more common and affordable than it is now. Avid internet users know that YouTube supports 360-degree videos. Today, these videos are becoming increasingly widespread. Unlike conventional videos with a limited field of view, 360-degree videos are omnidirectional and, therefore, immersive. Though this classification is disputed, immersive videos (as well as photos) are considered by many as a form of virtual reality. Users need to wear headsets to experience them to their fullest. For example, in a 360-degree video a user can move their head and look around the live scene. What’s the first industry you think of when you hear the term virtual reality? It’s probably gaming. The gaming industry has already embraced this technology – for instance, you can connect the PlayStation VR headset to a PlayStation console and enjoy VR experiences. Gaming, however, isn’t the only field where virtual reality technology can be used. Have a look our list of the most important applications of VR. VR learning content can revolutionize education, making learning immersive and more engaging. And apart from schools and universities, virtual experiences can also help businesses train their staff. Unimersiv is already offering VR educational content for businesses and institutions. Photos have been used by real estate agents to showcase properties for decades. But now, agents can use virtual reality for this purpose. 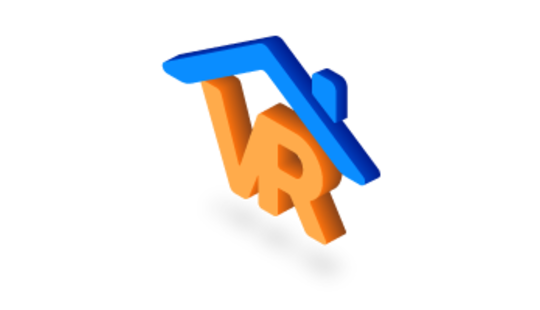 Unlike photos, VR is immersive, so potential buyers can take three-dimensional walkthroughs and better understand what each property has to offer before visiting in person. Matterport is already using 360-degree video showcases to help agents better interact with their clients. Moreover, VR can help architects show their projects to clients as virtual reality enables clients to see what their future property will look like. Being immersive, virtual reality can give an in-depth look into human anatomy, helping doctors better understand their patients’ needs. VR technology also comes in handy for surgical training. A platform built by Medical Realities uses 360-degree videos and virtual anatomy to train future surgeons. Thanks to virtual reality, businesses can reach out to their audiences by launching immersive and engaging marketing campaigns. This is particularly important in the age of online shopping, as VR experiences help people get a feel for products without leaving their homes. For example, IKEA created a VR application featuring a kitchen. Wearing a VR headset and using a controller, people can explore this virtual kitchen and even interact with it. The travel industry has always been quick to adopt new technologies, and it’s not surprising – people want to know what they’re paying for. Virtual tours can help travel businesses promote destinations and attract tourists. VR is also a great way for people who have a harder time getting around to explore the world. Google StreetView is the best example of how VR technology can be used in the travel industry. Though it’s possible to view panoramic images right on a computer, users can also enable Google Cardboard mode for a virtual reality experience. Augmented has already become a buzzword, but this technology is still a mystery for many people. So let’s give a clear explanation: augmented reality is the overlay of digital content on the real-world environment. 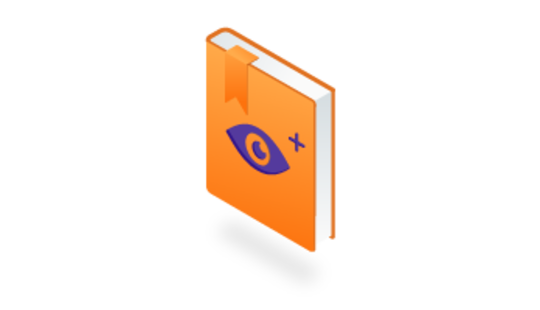 Virtual objects can be in various forms: images, videos, or interactive data. In other words, if you see the real world supplemented with digital objects, that’s AR. Imagine you want to buy a piece of furniture – a chair, for example. Augmented reality technology can help you check how different chairs will look in your room and pick the one that fits best. AR is the most accessible reality technology, as people can use their smartphones or tablets to run augmented reality applications. 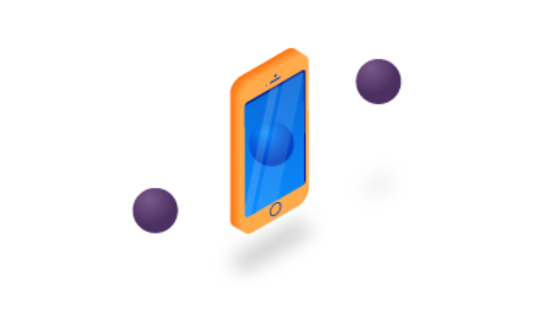 AR apps use a phone camera to capture the real world; virtual objects are then overlaid and users can see them on their smartphone screen. That’s how common AR apps work, the best example being Pokemon Go. Millions of people have used their smartphones to play this game and catch virtual Pokemons that they can only see on their smartphone screens. Another way to create AR experiences is to use special smart glasses or headsets. Unlike VR headsets, these AR glasses and headsets don’t immerse users into a fully virtual environment but just add digital objects to the real world. With Google Glass, for example, digital data is projected right in front of the user’s eyes. Now that you know what AR is and how it works, try to guess what industries this technology can be used in. And no, gaming doesn’t count. Though Pokemon Go was a real breakthrough in mobile games, augmented reality technology has a lot more to offer. AR, in fact, proves useful in a variety of spheres, from advertising to medicine. Let’s have a look at what fields augmented reality technology can be used in. Augmented reality helps marketers and advertisers reach out to their audiences more efficiently. Unlike conventional ads, AR ads are interactive and engaging so they not only promote sales but increase brand awareness as well. Manufacturing is an industry where new technologies can give a competitive advantage. Augmented reality helps companies improve productivity and quality. How? Manufacturing workers can get assistance from AR gadgets to reduce human error, save time, and increase efficiency. For example, Upskill offers an augmented reality platform for industrial applications. Some of the world’s biggest corporations, such as General Electric and Boeing, are already using AR in their manufacturing processes. Millions of people prefer making purchases on the internet. Online shopping is convenient, time-saving, and money-saving. But what if an item isn’t exactly what the buyer expected when it arrives? AR apps are a great solution to this problem, as they allow customers to virtually view or even try on products sold online. To experience AR in online shopping, try IKEA Place. This augmented reality application for iOS helps users check whether a piece of furniture from IKEA’s catalog fits into their home. Augmented reality is particularly useful for navigation. Virtual objects overlapping the real world can show directions and guide people to locations. Many businesses use AR to attract people to their stores; Yelp, for example, has a Monocle option that shows you the nearest cafes and restaurants. Imagine you need to repair something and you don’t know how. No doubt you’d either spend a lot of time watching DIY videos on the internet or simply ask a professional to do it for you. There’s now a third option, however – you can use a special augmented reality application to help you perform a repair. Now that you know the difference between VR and AR, it’s time to take a closer look at MR. In mixed reality (sometimes called hybrid reality), virtual content is not only overlaid on the real environment (as in AR) but is anchored to and interacts with that environment. Put simply, in mixed reality you can see virtual objects just like you can in augmented reality, but these objects can also interact with the real world. In a sense, mixed reality is a more immersive and interactive type of augmented reality. 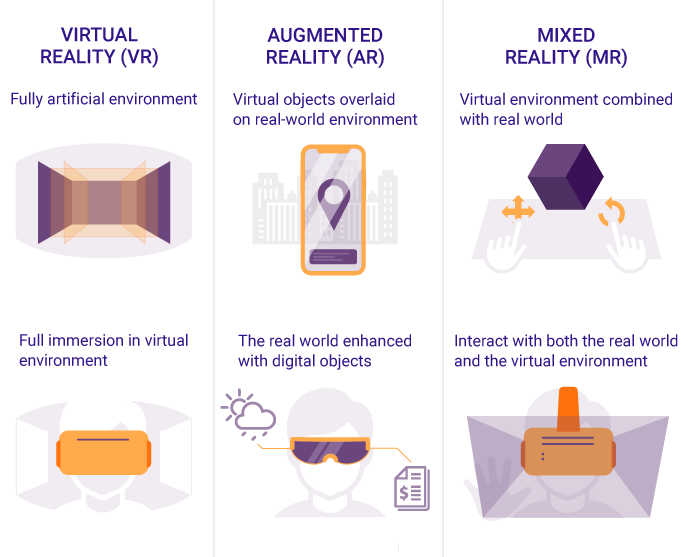 There can be, however, a different form of mixed reality – when users see and interact with a completely virtual environment overlaid on the real world around them. If this sounds confusing, think about it this way: imagine you’re interacting with a completely digital environment but you’re still in your room. What if you trip over a physical object in your room? To avoid this problem, a headset must be able to track the real world and adjust the virtual environment accordingly. This kind of mixed reality is closer to VR than AR; in fact, some VR headsets have sensors to track the physical environment too. These headsets have translucent glasses that allow you to perfectly see your surroundings. Virtual experiences are created with the help of holograms. That’s how Microsoft HoloLens works. These headsets have non-translucent displays that completely block out the real world (just like VR headsets) and use cameras for tracking. Windows mixed reality headsets from Acer and HP work this way. What Opportunities Does Mixed Reality Provide? Take any science fiction novel from the bookshelf and you’ll almost certainly come across a sophisticated holographic communication device. Well, mixed reality takes human civilization one step closer to the future described in science fiction. So what industries can mixed reality be used in? Let’s mention several industries with a huge potential for MR.
Mixed reality technology facilitates manufacturing processes by providing workers with real-time assistance. Workers can see holographic instructions right in front of their eyes so they always know what to do. This reduces the risk of human error and substantially improves quality. MR is also helpful for maintenance and repairs, particularly in industries that require expertise and precision. Is your head in a tailspin after so much information? Augmented, virtual, and mixed reality technologies are quickly developing. Subscribe to our newsletter to keep up on the latest news. How do you describe the use of AR in education? Hey Thomas! Augmented reality has a strong potential in education and unlike VR and MR, AR learning experiences are easily accessible – students need only their phones or tablets to use educational applications. Through immersive experiences and visualization, AR facilitates the learning process and helps students acquire and remember information more easily. For example, learning biology can be really fun and engaging if students can see virtual animals on the screens of their mobile devices. In fact, AR can be used to teach various subjects and to students of all ages. For more details and examples, you may subscribe to our blog and wait till we release an article about AR in education. Hi Thomas! This question is rather interesting and I think that it deserves a whole article, not just a small reply :) Follow our updates so you can get the most relevant information on the topic!